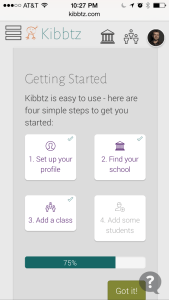 Kibbtz.com gives teachers the power to manage their classroom in a fun and easy way. This platform automatically collects the data educators need to support students. Created by a former teacher, Kibbitz allows teachers and school administrators to make behavioral support decisions based on data. It keeps track of data on student behavior – both positive and negative. With Kibbtz teachers can quickly build reports for conferences and team meetings that address student performance by having meaningful data on student behavior. This platform works for individual classroom teachers or in schools where students are serviced by a variety of educators. Teachers have the option of adding notes when they enter different behavior, and there are tools built in to make sure there is a balance of positive reinforcement. Kibbtz is free for teachers and optimized for mobile devices, and they’re even offering weekly prizes for their active users. Check out their website and blog for more updates and teacher tips for using Kibbtz in the classroom!